Hi, thank you for taking the time to read my post. This is how I made my Nightingale Armor and prop weapons. There are many ways to make this armor set, this is how I did it. I believe in sharing skills and abilities so I complied this set of photos with as much of a description as possible. I just learned how to sew and I don't know a lot of proper sewing lingo, so forgive me as I try to explain what I did as best I can. 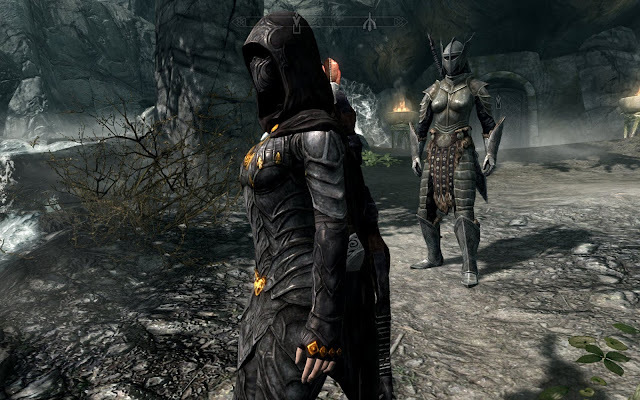 Why I chose the Nightingale Armor from Skyrim: I love this armor set. I play Skyrim and when I got the armor as a quest reward I nearly peed my pants. "I'm Batman!" I yelled. I had not cosplayed in about a year so I decided late last summer to start planning and buying materials. This appears to be a modified version of the armor which adds golden details. These details are black in the original vanilla game. I bought all my materials and asked my mom to help me figure out how to compose the pattern for the top. She used to make a lot of costumes for me as a kid. Mentally I broke down the top part of the torso armor into 2 pieces, a collar and a corset style bodice. They would be connected by a series of straps that snapped on. Then scales would be individually added in a symmetrical layered formation. Mom suggested making a tube for the base of the bodice and then making each scale individually and sewing them on the tube top. I cut out each scale in paper first giving it a half inch extra width for the seams. 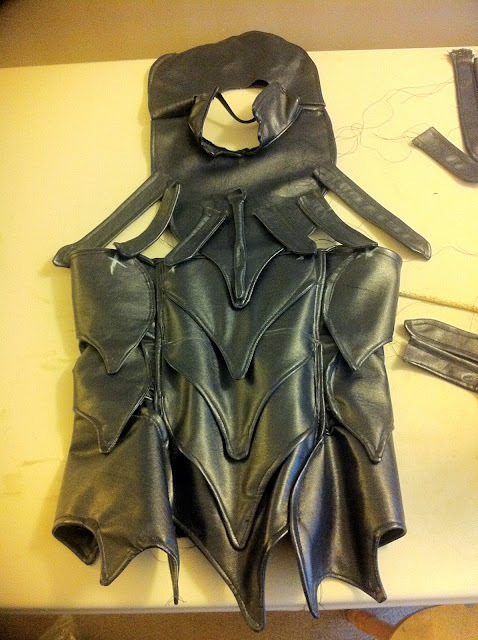 I cut out 2 pieces of each scale from the stretchy pleather and sewed them front to front down 3 sides. Then I turned them right side out and tailored the edges. Every scale was mirrored so that I would end up with a symmetrical pattern on the other side. Me wearing the body suit with my costume progress over top. The collar is really just 2 half circle shapes that I joined at their straight edges with a hole in the middle for my head. 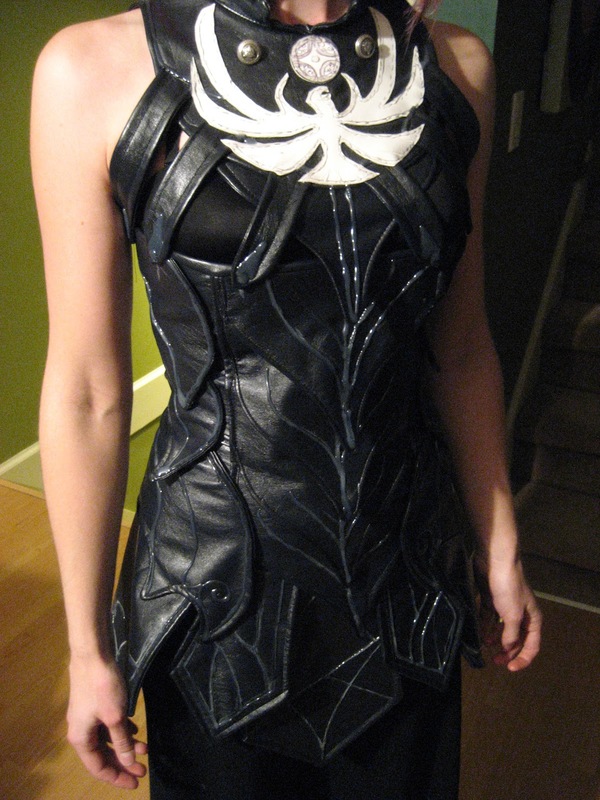 I added 12 straps and an additional scale to the collar to connect it to the now scaled bodice. 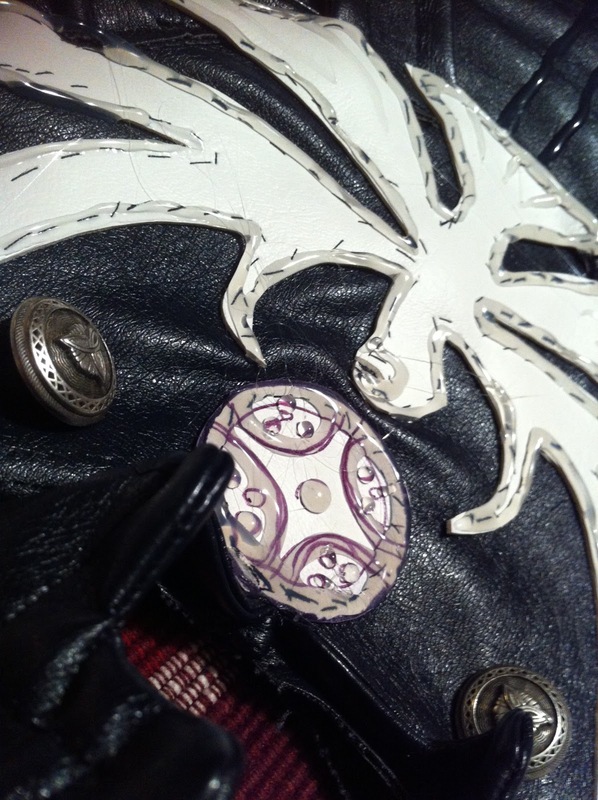 White chalk was handy in marking sewing spots on the dark pleather. The top after I sewed all the scales onto it. Here I was marking where the straps would be snapped into place. I sewed the straps to the collar and then marked where to put little black snaps. I hid them under the point of each strap that attaches to the bodice. The straps were just two pieces of pleather sewn front to front like the scales and then turned right side out and tailored along the edges. The skirt panels were sewn the same way as the scales of the bodice. Once I had them pinned in their correct order around my waist I just ran them under the sewing machine along the top. To cover up the stitch lines on the collar I cut out the Nightingale symbol out of the hard vinyl and hand stitched it on. The mask, arm, shoulder, and leg pieces were also cut from the stiffer white vinyl. I used little d-rings to be able to tighten the straps and make them adjustable. Testing one of the leg pieces. They fit! The leg pieces being laid out for sewing. This mask ending up being too small. I have since made a new one more akin to the original design. The mask was super easy. I want to make more! I cut out a birdlike shape from the vinyl and slit it halfway down the middle. Then I overlapped the sides so the mask bent and fit my face. A little triangle was hand sewn to the top of the bridge to make it W shaped. used white chalk or markers to help with my lines. **A note about the hot glue: It stuck to the vinyl and the pleather. 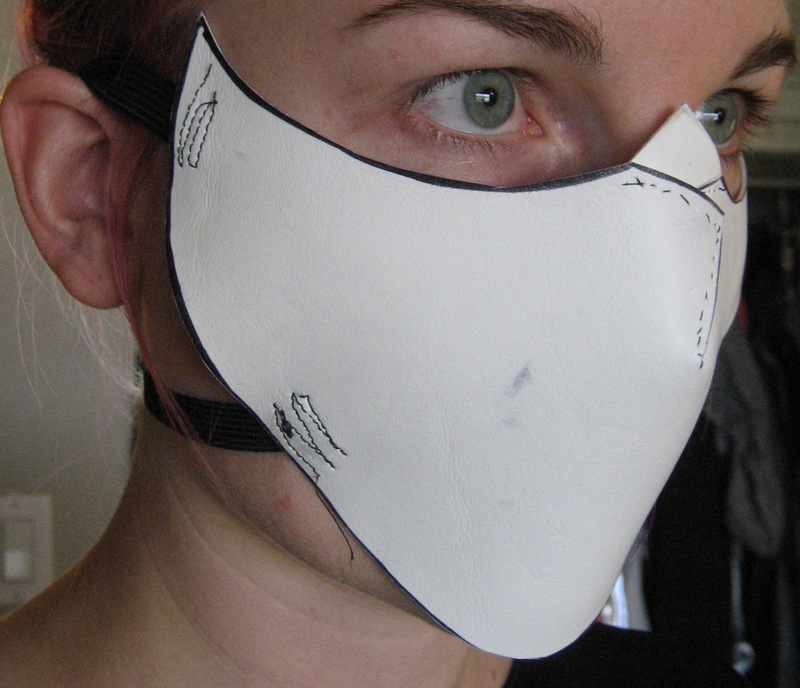 But when I made a new mask out of a new black vinyl, the glue constantly peeled off. Test this technique out before you buy 3 metres of expensive vinyl. Without a body suit this armor looks pretty cool. different versions of the costume. 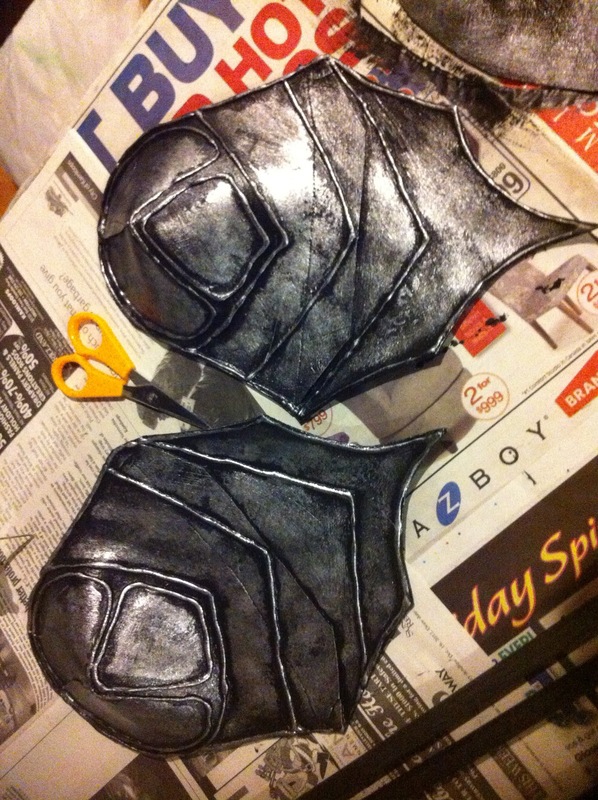 I had to paint EVERYTHING black when the I was finished with the hot glue. 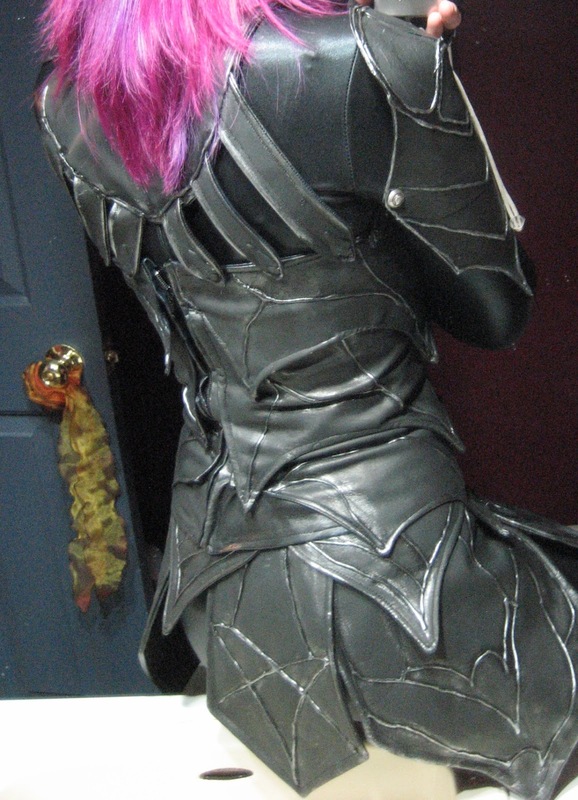 Once I realized it all needed 3 coats on the front and back I regretted not buying black vinyl and pleather. But it was so cheap, I got it on a super discount! After the black paint finally dried it was time to spray paint. In our garage I laid all the armor out and sprayed silver spray paint onto a piece of paper towel and immediately rubbed it onto the armor. This gave the armor a tarnished look. The darkest black was in the recesses and any protruding details had a polished look to them. I also went back over the silver with more black paint to tone it town a little. **Something I should mention: The chemical combo of painting vinyl with spray paint and acrylic never actually dries. It remains sticky forever. I dusted my armor with powdered cornstarch to fix the issue but it slightly alters the look of the armor. It becomes less glossy and more matte. A rare photo of what the back actually looks like. 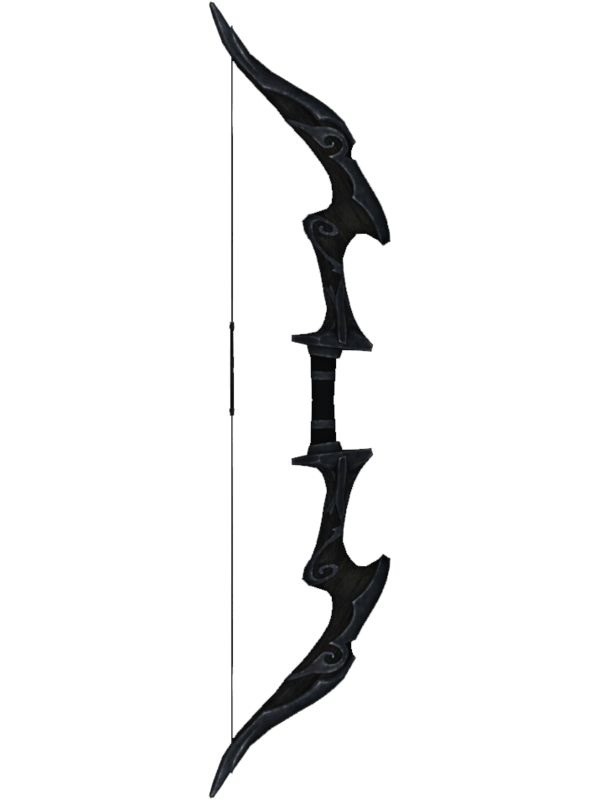 The bow took me months! Is was so big I had to clear off my whole work table to be able to work on it which couldn't happen very often as I had numerous other projects going on. I had no idea what to make the base of the bow out of so I waited for halloween and bought an adult toy bamboo bow. 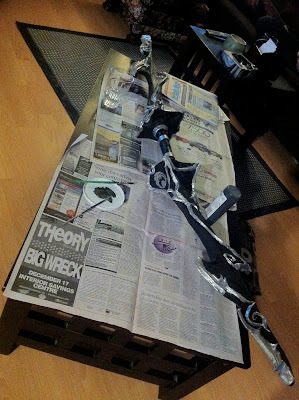 I cut out pieces of cardboard to shape it onto the Nightingale bow and used duct tape to adhere them on. I used a small cardboard tube for the handle. 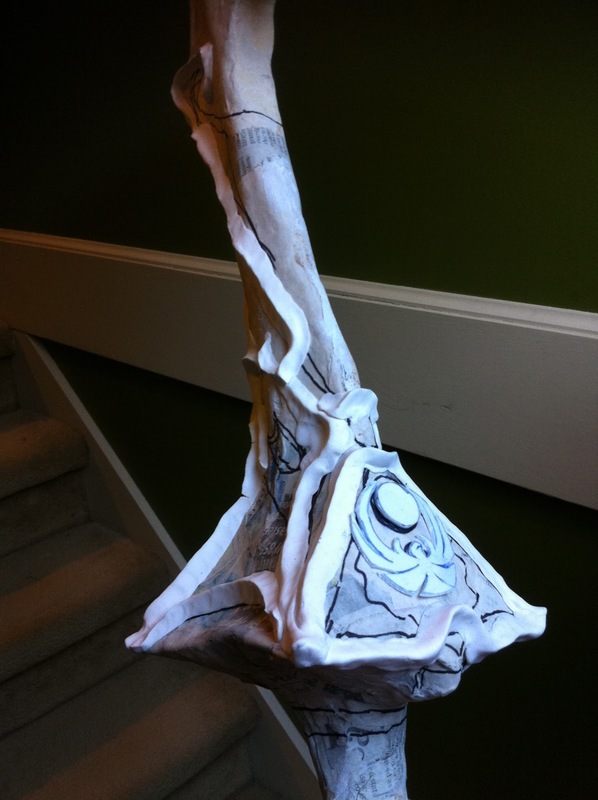 Then I made a batch of paper mache mix and applied newspaper strips all over. This was a very long process. It needed 3 overall coats but couldn't do the whole bow at once or it would stick to whatever was holding it up. Cracks started appearing about 4 days after it was placed somewhere to dry. These had to be patched with more paper mache and in waiting for the patched areas to dry more cracks would appear! Drove me crazy! I put Elmer's Glue in my paper mache mix and that seemed to have stopped the cracking. Model Magic doesn't need any glue, its like playdough that self adheres to anything! Super handy. Its also very lightweight once dried. After 2 days the Model Magic dried and I sprayed a coating of Verathane wood sealer onto it. Once this had also dried it had sealed and glossed the Model Magic so that it wouldn't be porous anymore and the spray paint would sit better on it. I'm not sure if I am explaining this correctly but without a sealer the Model Magic absorbs the spray paint and it still looks like foam. I wanted it to look like metal. The spraypaint took a few days to dry. Once it was done I painted everything black except the Model Magic parts. For some reason I decided to braid 3 lengths of stretchy rainbow bracelet cord for the bow string. I don't know why I didn't just get a black stretchy cord. I wanted to make things harder for myself I guess. After stringing the bow it was done. 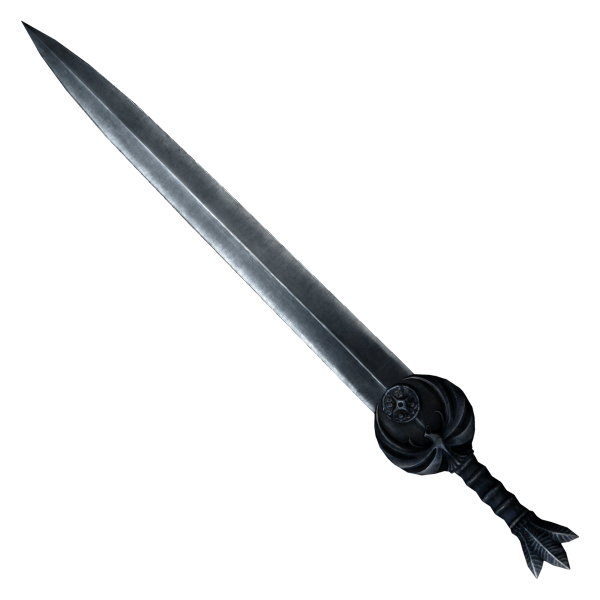 Compared to the bow I'm glad the blade was so easy. I bought an adult sized halloween sword and hacked off it's hilt with a saw. 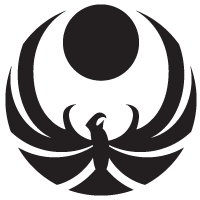 Then I simply formed Model Magic around the pommel in the shape of the Nightingale symbol. I used hot glue for a few details on it. Verathane and silver spray paint were used on it as well. I made a Daedric quiver using the crappy quiver I got with my bow when I bought it. The added details are made from craft foam, Model Magic and hot glue. 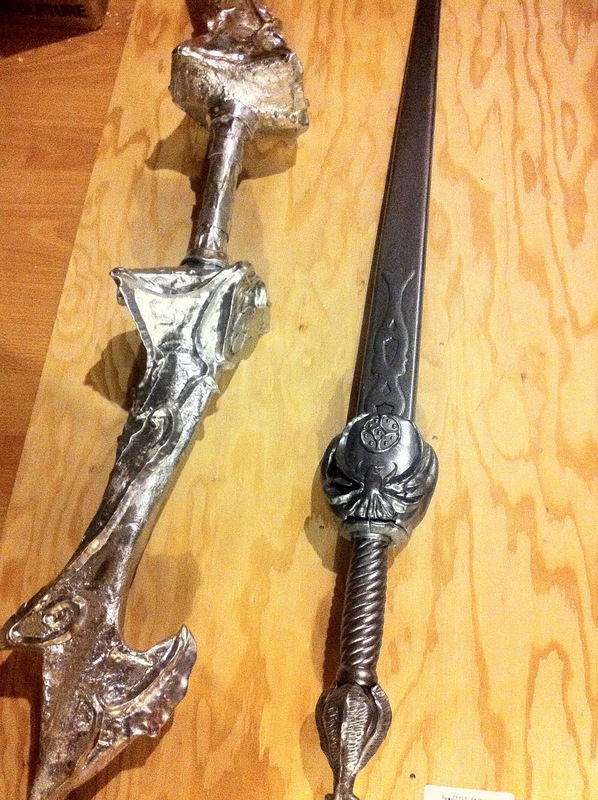 The quiver was treated in the same way as the armor; black paint, and silver spray paint. Arrows were made from hot gluing black feathers to doweling and painting them black. I made one really big epic arrow for photos. The tip is made of fired porcelain. I tried making the arrow heads out of Model Magic but they all broke off. For all the work I put into this costume I will enjoy cosplaying as a Nightingale for the next few years. Wow if you read all the way to here THANK YOU for your time and I hope this blog was informative. Thanks you and keep on cosplaying! Oh wow. I've never attempted to make anything so elaborate before, but your end result is breathtaking! Just incredible. Also, if you'd like a dress form on the cheap, you can make one using $10 worth of duct tape, a few hours of your time, and a good sense of humour. I used the tutorial from Offbeat Bride but there are several online. Having one saves soooo much time, and the DIY version ends up perfectly matched to your measurements. Hi I like your blog! Thanks for the tip on the DIY dress form I will check OBB for that. Gorgeous, and the photography just makes it perfect. Everything that's best about gaming and imagination made real. Hi do you mean how much money did I spend on making this costume? Hi, I think I spent $500.00 Canadian dollars on my materials and supplies. Yes you can it's easy. Like really easy. And making up patterns is a really great brain exercise in geometry. I was kidding. I actually do know how to sew... by hand. It tends to keep my projects smaller than if I had a sewing machine. Oh, and for your saviors hide cosplay I would recommend the Stormcloak officers boots and gauntlets. Nothing else I've seen really seems to go with it all that great though the foresworn equipment could work I suppose. Good idea on the bracers. Happy to be of service m'lady. 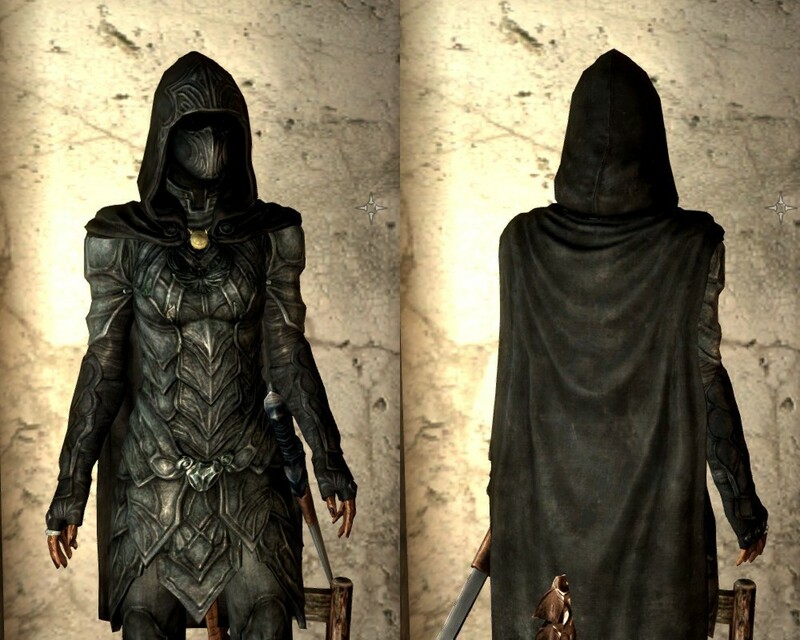 I do like the dark brotherhood robes. Those would be fun to make. Or maybe i should cosplay as the Nightmother....hahahahaha. That will only work if you also make the coffin. Oh wow. That is easily THE best Nightingale costume I have ever seen! Looks to me like it was a ton of work to pull off, but the whole thing, bow and sword included, looks amazing! Good luck on the Savior’s Hide armor. Looks like you’ll need a lot of fur attachments for that one, or what comes close to it. Haven’t really checked Skyrim lately, so I can’t really associate which armors goes best with which, but I will pop by again as soon as I have some idea formed. Cheers! Thank you so much Mila! I have the pattern made for the fur and the mertials for most of it. i am just waitin for my Worlb to arrive for the metal bits before I start. I can't wait to finish it! 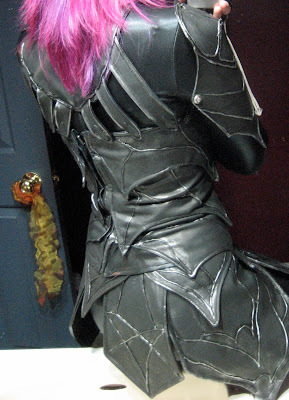 May I ask, did you sew the scales for the skirt part together at the top overlapping, or to something like a belt? 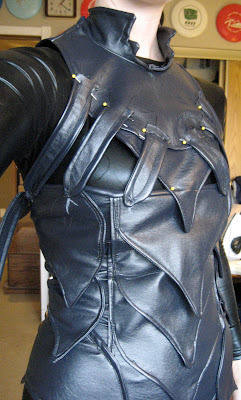 And also, would it work if I made the arm pieces closest to the gloves out of pleather and have a zip? or would the vinyl work better? Sorry for the late response! I sewed the skirting all together buy pinning the top corners together and just running them under the sewing machine. I used hooks to fasten the skirt around my waist. As to you question about vinyl or pleather for the arm guards, I used vinyl because it is thicker. I keep rereading this guide. Sometimes to figure out how I want to make a certain part. But more often than not it's for no discernible reason. Maybe one day. I only make what I really like. i can't take the time off to do this myself cause of school do you think you could like make one for me and i can pay you for it? Hello! 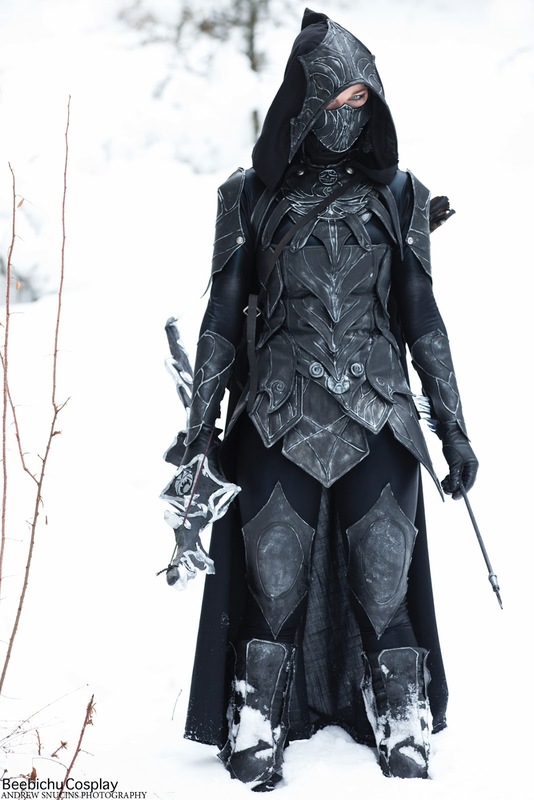 I have a couple questions for you if you're okay with me asking them; I want to try making Nightingale armor as well because holy crap, is yours beautiful. I've got roughly three months before PAX so this is going to be motoring for me. Anyways, how'd you make the bodice base itself? Is it just a tube, or did you fit it to your body? How did you size the pieces in relation to your body as well? What process did you use to stitch the raised collar onto the shoulder armor? Was the cloak a pattern you altered? I've never drafted a pattern by hand and am nervous to give this a shot, but I'm dedicated to this so we'll see how it goes. Thank you for any further detail you can give me and I would love to give this a shot as well. You are amazing for posting these details in the first place and your work is beautiful!